I had a great evening admiring luxury leathers and hobnobbing with fashion bodies at the recent Sarah Forsyth store opening on Chelsea's King Road. If you've ever been to the King's Road, you will know it's a pretty glamorous affair, populated by well-dressed, perfectly groomed individuals and the odd Made in Chelsea cast member (Mark Francis was the evening's spot, with Ollie Locke's Union Jack car parked up indicating he was also in the vicinity). With such stylish clientele in the area, I have no doubt that independent handbag designer Sarah Forsyth's first store will be a big success in Chelsea. Sarah's trademarks are unique, stylish handbags crafted in the finest leather and exotic skins. Clean and minimal designs allow the luxurious leathers to do the talking, with colour block and metallic colour ways adding that individual flair to the collection. 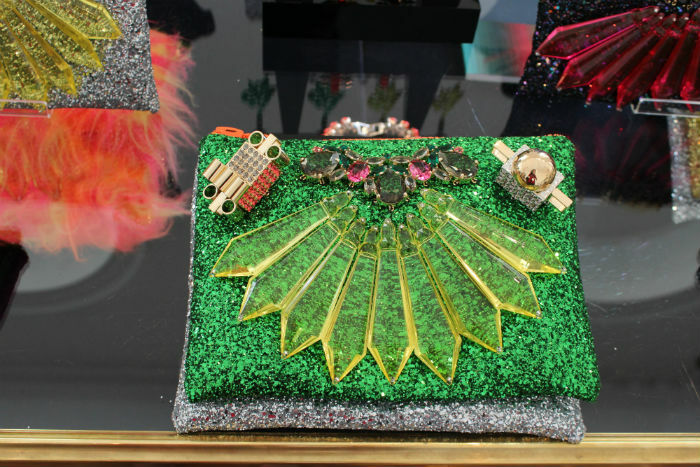 These are seriously precious clutches and totes that will take the Chelsea dweller from St Trop to Capri in one accessory. I highly recommend visiting the shiny new store at 319 King Road's (opposite the MIC hotspot, The Bluebird) to ogle the collection for yourself! Turquoise, tangerine and hot pink look beautifully bold colourblocked in these stylish clutches. The finest leathers and skins are crafted into accessories in the collection. The boutique has a lovely light and airy feel. Handbags on display in Beaufort house at the afterparty. Myself and my fashion girl Katie from Glass of Fashion blog. I went for a red theme & wore my favourite Lanvin H&M necklace with a red Zara blazer and Thomas Sabo ring. 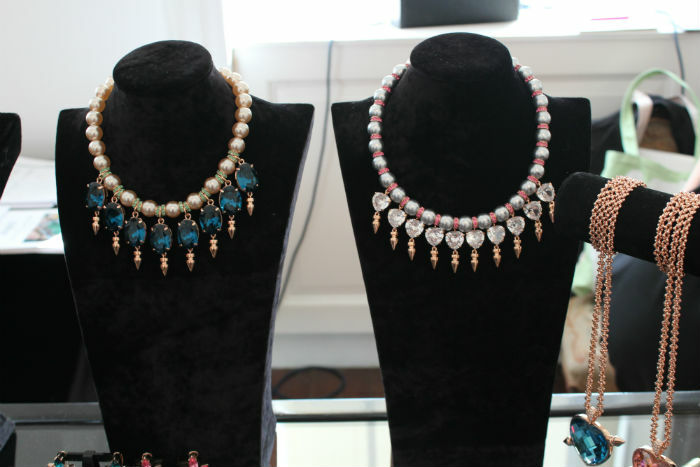 It was great to meet Jaime of Boy Meets Fashion at the event- excellent blog chat! I'd like to say a big thank you to the lovely folk at Goodley PR for the invite,warm welcome and fabulous after party! 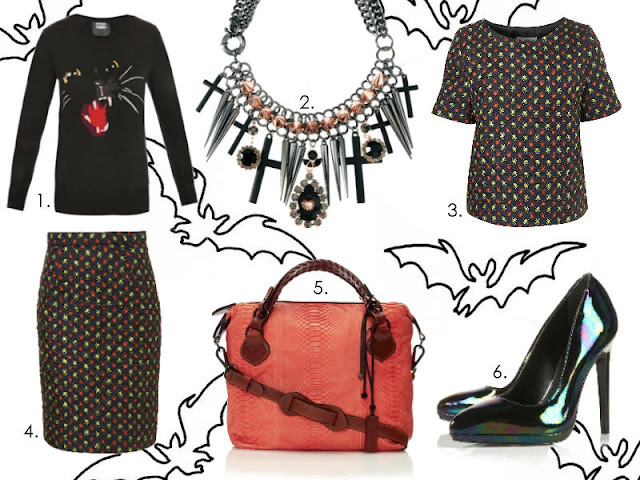 GHOULISH FASHION FOR HALLOWEEN & BEYOND! 1. Markus Lupfer cat sweater, Matches, £270. 2. Premium spike & cross necklace, ASOS, £60. 3. Quilted Spider silk tee, J W Anderson at Topshop, £59.99. 4. Quilted Spider print skirt, J W Anderson at Topshop, £69.99. 5. Pauric Sweeney blood orange overnight bag, Selfridges, £1,780. 6. Iridescent pointed courts, Topshop, £80. 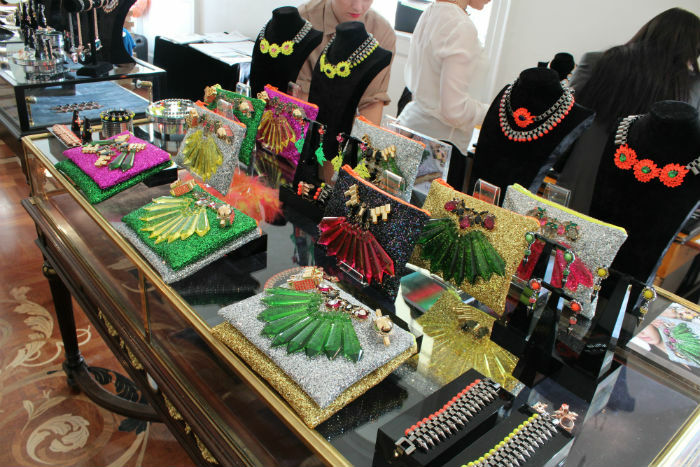 During London Fashion Week one wing of Somerset House tranforms into a mega style showroom where fashion and costume jewellery brands showcase their new-season collections. 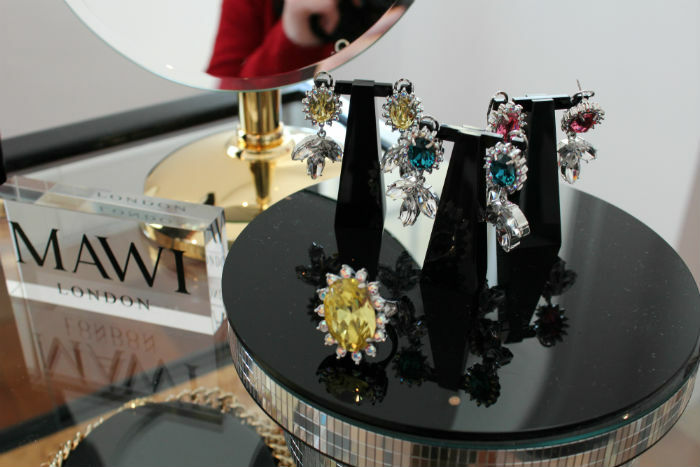 My personal highlight of SS13's showroom action was delivered by my favourite British jewellery house, Mawi. 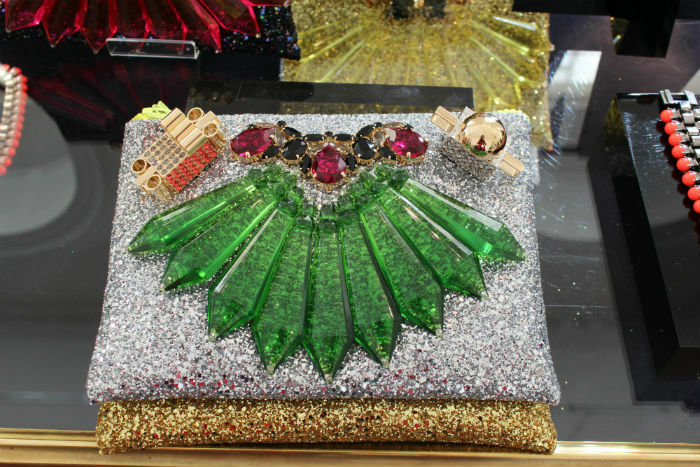 If you're unfamiliar with the brand, Mawi is the go-to jewellery designer for luxurious statement pieces with a contemporary edge. Think oversize jewels, spike details, chunky chains and you're on the right lines. 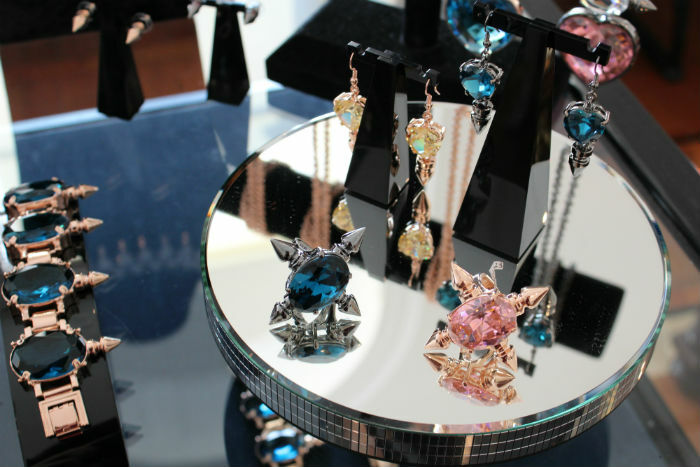 For SS13 Mawi's contemporary costume jewellery has taken on a more feminine feel, with pastel hues, iridescent jewels and gem-set petal details adding a softer edge. 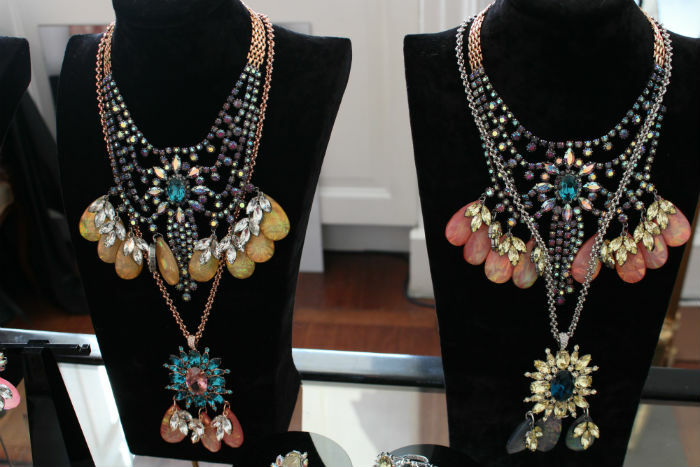 These are statement pieces with a feminine flourish. 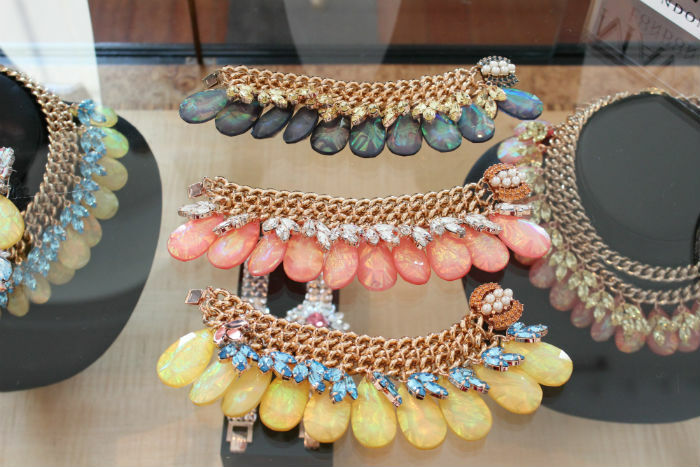 Iridescent-effect jewels added a pretty-finish to statement styles. So.... 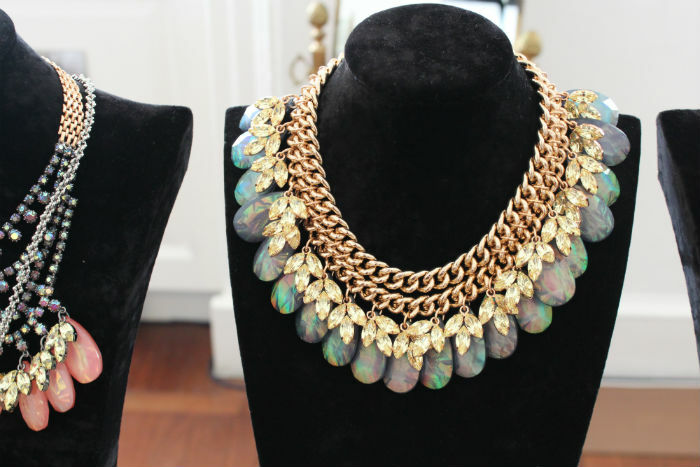 I want this necklace. Cocktail rings and statement earrings. The new line of clutch bags. 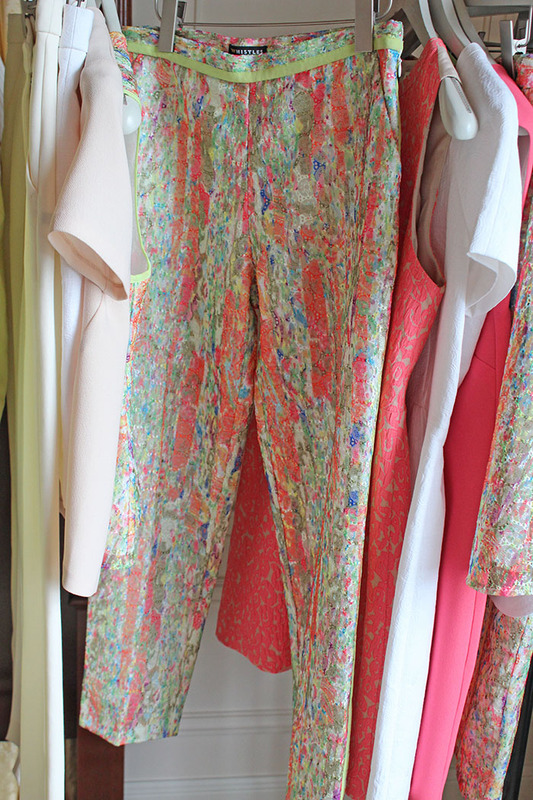 Neon is still a key colourtrend for SS13 at Mawi. Head to the Mawi website to see their current collection. The coolest way to beat the chill this autumn/winter is by donning a witty knit or sweater emblazoned with a topical motif. A knit with wit is a key style for the season (see Burberry's AW12 owl jumper) and if Ashish’s SS13 catwalk was anything to by, the trend will continue well into 2013 too. 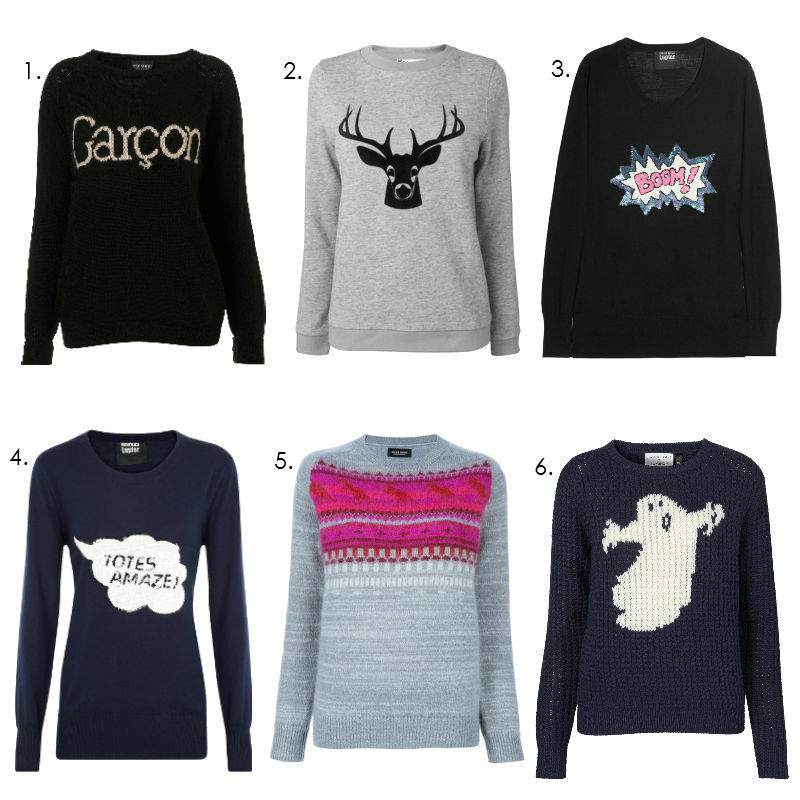 Whether you opt for a cute motif or a fun slogan (Markus Lupfer's 'Totes Amaze' sweater is my absolute favourite! ), this trend is all about having fun with your fashion. I've just splashed out of the J W Anderson for Topshop ghost knit (number.6) which was also seen on Alexa Chung recently. And hey if a knit with wit is good enough for Chung, then it's good enough for us! 1. Knitted Garcon jumper, Topshop, £40. 2. Flocked deer-print sweater, Jaeger, £60. 3. Markus Lupfer Boom sweater, Farfetch.com, £295. 4. Markus Lupfer Totes Amaze sweater, Harvey Nichols, £295. 5. Sophie Hulme Dino pattern sweater, Farfetch.com, £465. 6. J W Anderson for Topshop Ghost jumper, Topshop, £69.99. 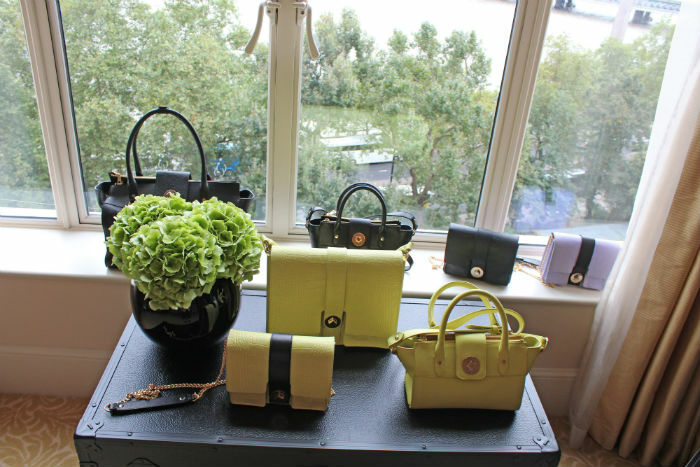 A highlight of my off-schedule London Fashion Week events was attending the Whistles SS13 press day in the fabulous surroundings of the Savoy hotel (in a private suite, no less). Whilst it’s a joy to see the aspirational, theatrical and downright bonkers paraded on the catwalks during LFW, it also proved a real treat to preview clothes that I can actually buy, own and make my own for SS13. Upon arriving in the Savoy suite, I did find it a little tricky to compose myself when confronted with rack upon rack of covetable SS13 collections and (this is where I really struggled to contain myself) Jane Shepherdson herself, aka Whistles' CEO and all-round high street guru (also responsible for rebranding Topshop and turning it into the fashion mecca it is today, no less). So here are the snaps I took in what can only be described as an 'over-excited fashion girl trance', and the key trends I absolutely love that Whistles are showcasing for SS13. Check out the fabulous view of the Thames from the Savoy suite! 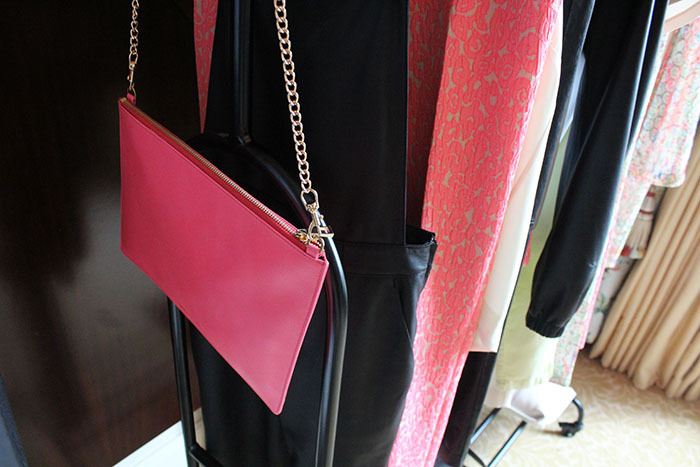 Whistles have continued to develop their accessories line for SS13 with clean structured shapes remaining the key theme. Love the bold citrus hue of these totes. A signature style of the whistles brand is a good print, and for SS13 we have geo and leopard prints across chic seperates. 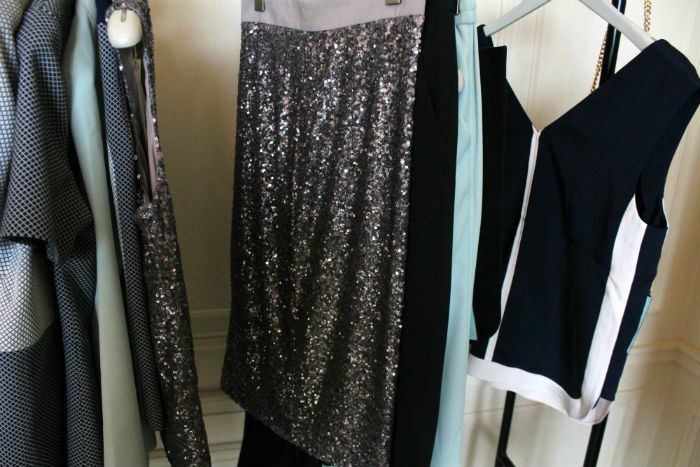 I really loved this silver-sequin encrusted pencil skirt. A bit sparkle mixes this up for spring/summer. Mark my words leather dungarees are about to be a huge trend! 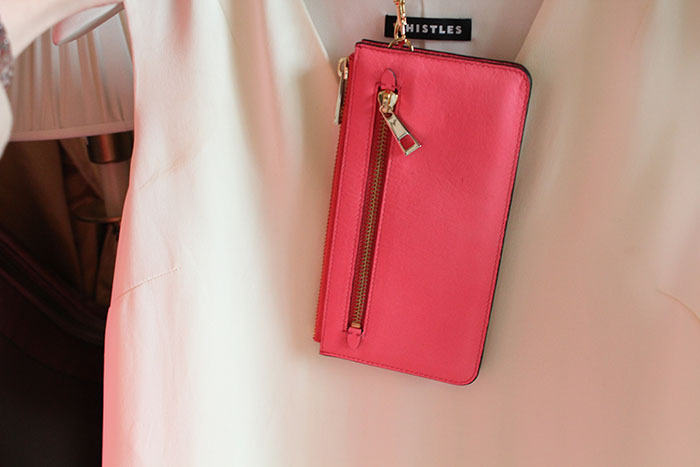 Whistles' interpretation are super-sleek & butter-soft- trust me you can wear these babies! I loved loved loved the clean & simple accessories line. This minimal & chic chain strap number was really doing it for me. 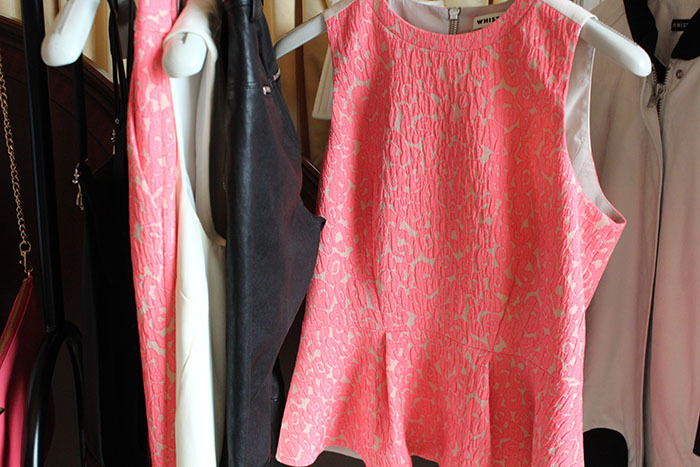 Plus I'm so happy to see subtle pops of neon are still a key trend for SS13! My stand-out pieces were the broderie anglaise separates (tailored cropped pants and shell-top with peplum detail) flecked with multicolours and pops of highlighter pink. This is seriously beautiful fabric, even better when viewed in person. Peplums are still a key shape next season at Whistles- although this top has a subtler shape than last season's pronounced styles. 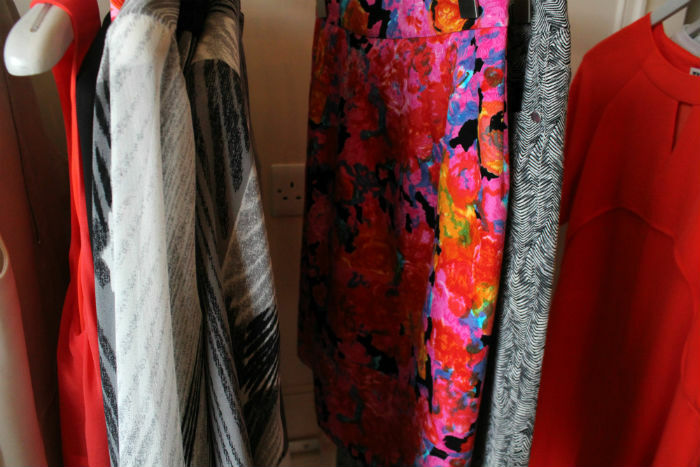 Sorry for the rubbish picture- but I'm trying to focus on the lovely floral colour-pop skirt here. I loved the modern length (just above the knee) and the bold colours! Would look fab toughed up with a leather jacket. 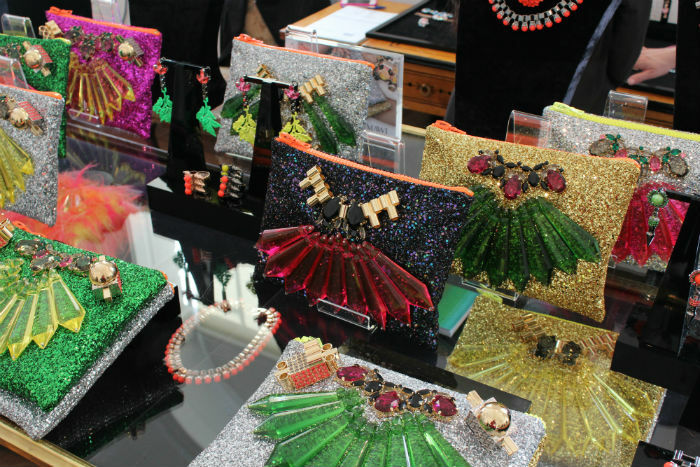 ......even the coin purses were covetable! I'd like to say a big thank you to the Whistles PR and Marketing team for inviting and the making me feel so welcome at the press day! Fabulous and friendly ladies. I like to think of myself as a bit of a handbag connisseur (or pervert, whatever you prefer) and KG’s new-season accessories line is ticking all the right boxes for me; reassuringly chunky chain straps, tactile pony hair details and clean shapes all create that high-end look. In particular I am lusting after the iridescent Lollidrop Mini Chain Bag that has a Marc by Marc Jacobs feel for a purse-conscious £80. What could be sweeter! 1. Rhubarb Rock Bag in Leopard, £270. 3. Sherbert Jazz Bag in Green, £120. 4. 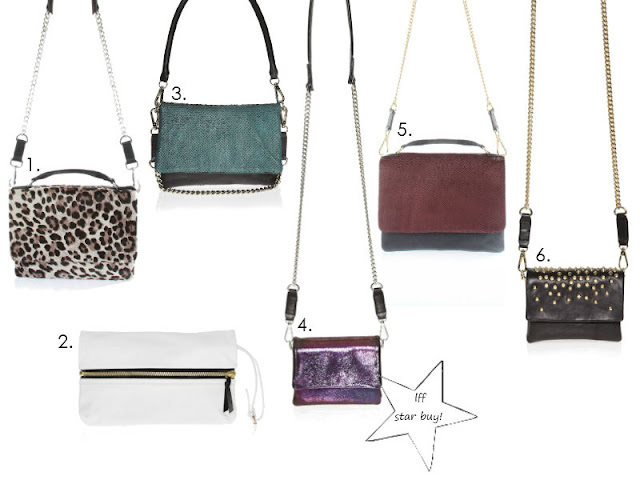 Lollidrop Mini Chain Bag in Multi, £80. 5. Rhubard Rock Bag in Red, £250. 6. Lollidrop Mini Chain Bag Studded, £100.